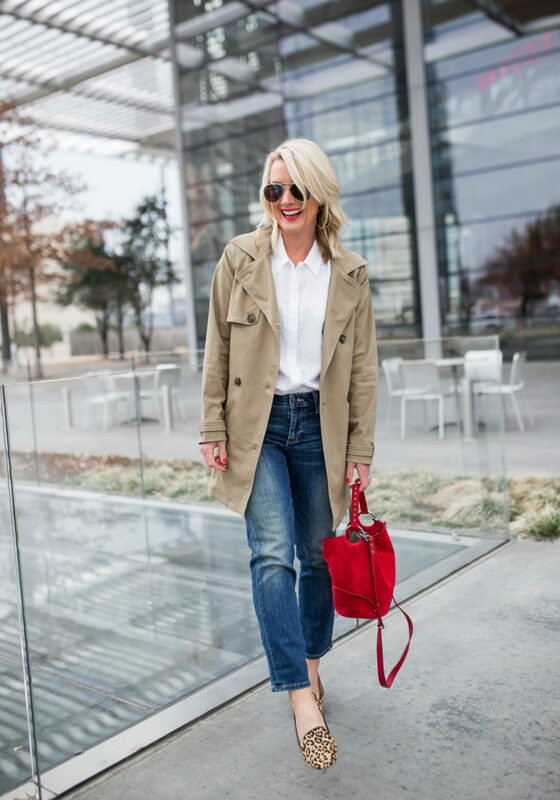 Work to Weekend | Classic Trench Coat | hi Sugarplum! Did you ever watch Project Runway? I used to adore that show (is it still on?! ), and even Mr. SP would watch it with me…usually just so he could throw in his ‘funny’ comments. Tim Gunn was my favorite and I loved his dapper, gentlemanly style. 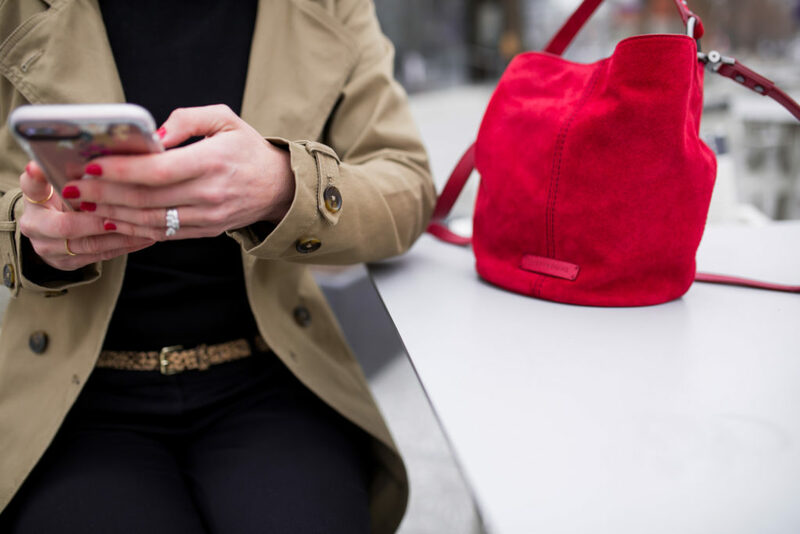 He always said a trench coat was a closet staple, and one of those pieces every woman needs in their wardrobe. In fact, most every ‘Must Have’ wardrobe staples list, includes a trench coat. And for good reason…it’s genuinely one of the most versatile pieces for most every season. Plus, it’s impossibly chic. 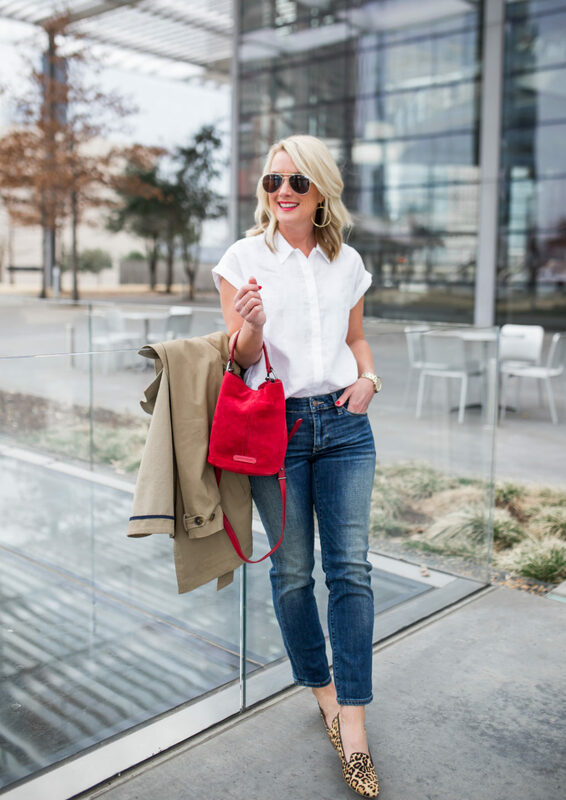 For today’s Spring Transition inspiration, I’m styling it for Work and Weekend. 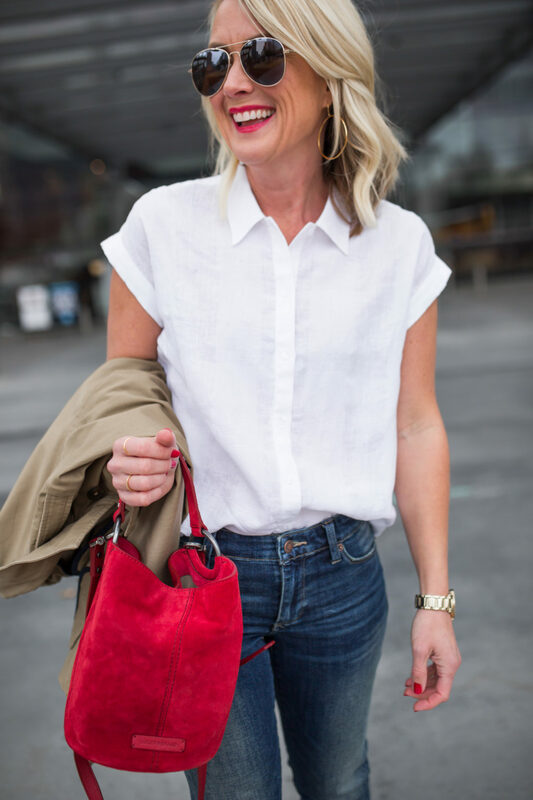 A fail-safe outfit is always head-to-toe black…it’s my go-to when I have no idea what to wear, or the time to think about it! Trench coats are timeless, but not all are created equal! You want it thick and sturdy enough that it holds it’s shape when worn open or closed, like this one I found at Lucky Brand. I love the darker shade of khaki for more multi-seasonal options, the rich tortoise buttons, and extra touches like the button-tab cuffs and storm flap. 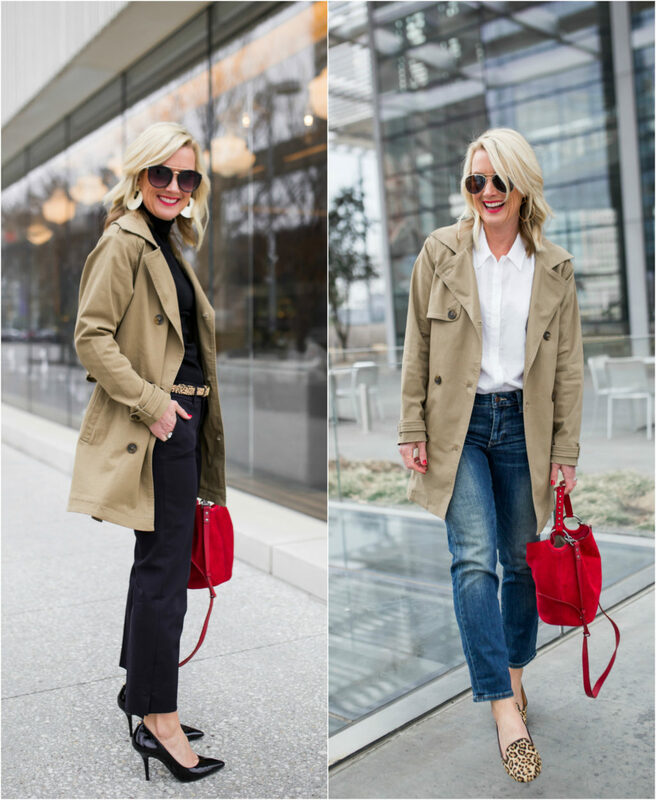 Fit Tip: The trench runs true to size, with enough room for layering in Spring and Fall. I’m wearing an XS. It’s also a great jacket for throwing over casual weekend outfits, and even dresses them up a bit. It’s extra-feminine when buttoned closed with the tie cinched at the waist. 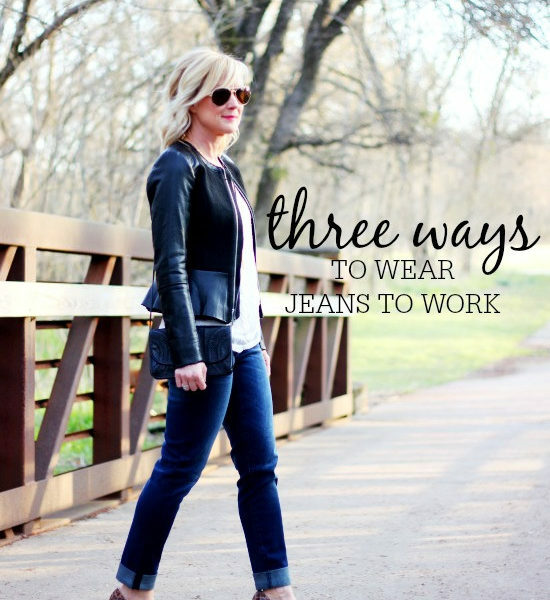 Fit Tip: The jeans run a tad big, but I stuck with my usual size for a relaxed, straight leg fit. The hem has a touch of kick which looks darling with flats, and they have a perfect cropped length for Spring. I’m wearing a 2/26. All denim is buy one get one 50% off, too! I’m ready for you, Spring! Do you have a trench coat? I know I’ll have this one for years to come, and it will never go out of style! How do you like to style yours? Happy March, friends! I’ll see you back here tomorrow for a huge Dressing Room Diaries! With that red bag! YES! Happy March indeed–we can see the spring in your step! 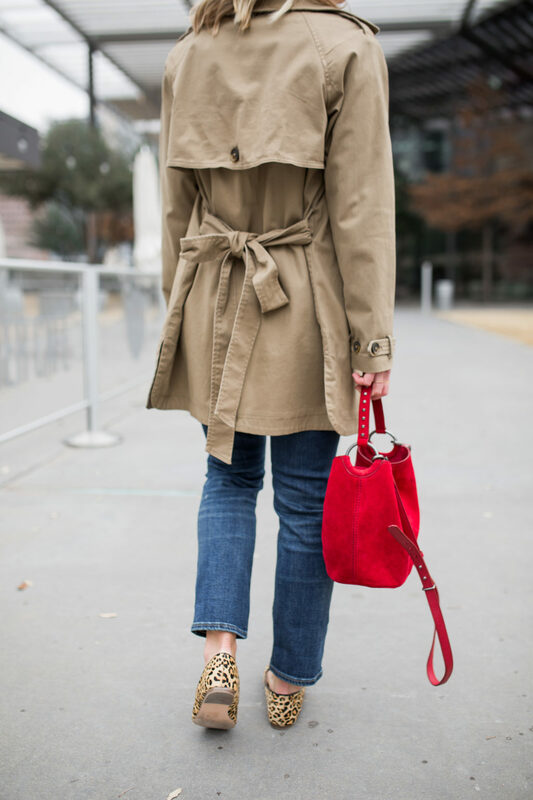 Trench coat looks chic with the black outfit and red bucket bag. Love the outfits and especially the red bag. But I’m a fair-skinned blonde and khaki has never been something I could wear close to my face. Is there a tone that works? I’ve never found one. Thanks Leslie! That’s one of the reasons I love this particular trench so much…the tone of the khaki is deeper, so it doesn’t wash me out! Thanks. Yes, maybe it would work. That reminded me that way back in college I think I had a longish London Fog trench that was a weird pinky khaki. It had a zip-out lining. I don’t think they make that color anymore! I love a trench. There are many styles of trench, so there is a style for every one. If double breasted doesn’t work because of the girls, buy single. If khaki doesn’t work look for an ivory or black to keep it classic. The less fussy details the longer it will stay current. Wear it with your jeans or a dress. Want to stop at the store after yoga – throw on your trench. I even wear mine in the colder weather by layering it over my leather jacket. Loved seeing you bring the trench forward, Cassie. Thanks, Joanna! Now I’m even more inspired!! Gads! Your “Carmen Sandiego” reference takes me back… Way back to my childhood, playing this game on the computer in the late 80’s??? with my dad and my brother. I do think everything was in text and pre-graphics. We loved that game!!! Super fun post. Ok, so fun to see a new look on you! I love the trench and the flats. So adorbs! Thanks so much, Angie!! I’m so smitten with this coat, and the leopard flats have been on repeat! Love both outfits, so classic but it still inspired me! Where are the black cropped pants from? Also, does the white top run TTS – sizes are already selling out! Yes Project Runway is still going strong. It moved to Lifetime channel years ago, so maybe that’s why you have missed it. You rock these looks, and those jeans look super good on you. I’m gonna give them a try too! Good to know about the show…I need to look it up!! I can only imagine how kookie the challenges are now! So stylin, Ms. C! Great classic get up for everyone. That bag, real wow factor. Perfect! 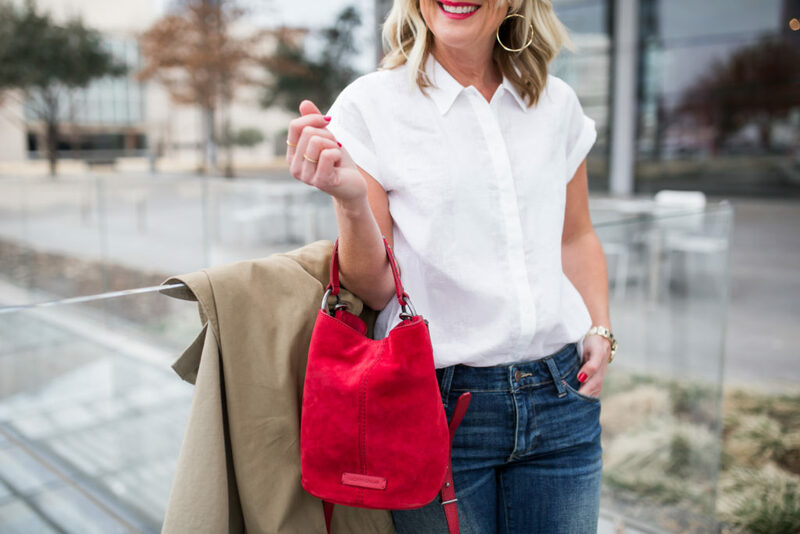 I have a red trench that I am looking forward to wearing this spring – it originally was a longer length but I had a tailor shorten it to above the knee – looks more modern and works great with jeans and slacks. Until I had it shortened it hung in the closet for a few years. The shorter length is a whole new look. I love this coat and both outfits with it. The red bag and flat shoes are fabulous. You look amazing, as always, wearing both. Thank so so much, Ivory!! I haven’t watched Project Runway in awhile. I always remember Tim Gunn say, “Make it work.” I love your trench coat. I especially love how it ties in the back. I love your style! I’ve gotten many of your suggested items since you make it so easy by including the links! 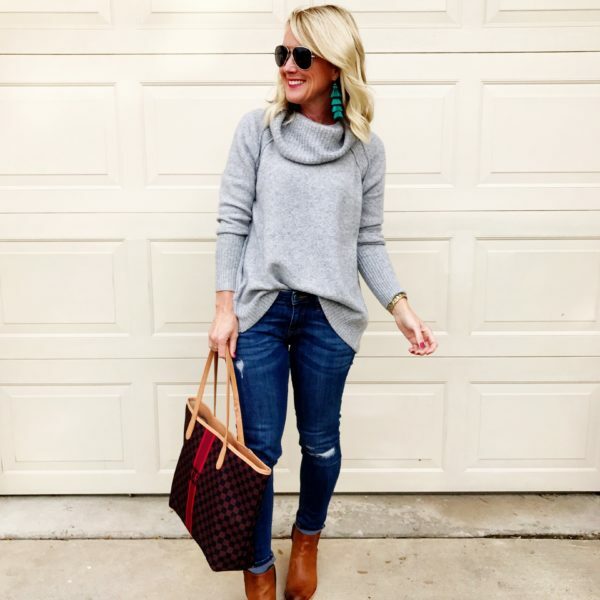 My favorite are my Bauble Bar earrings and Hue leggings! Woukd you please share the designer of your black pumps in the above outfit with your trench coat?? They’re gorgeous! Love the outfit with the leopard shoes! Such a great combo of pieces.